Among the tools professionals count on most is a flashlight. 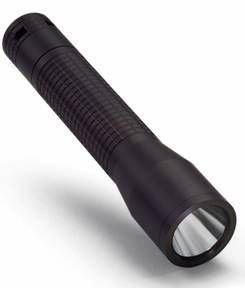 The INOVA T3 LED flashlight provides the strategic balance of durability, compact size and powerful light performance they are looking for. By incorporating a flared head design in a 6.25 inch body, the T3 is capable of projecting a highly intense beam of light up to 250 feet. A three-way, mid-body switch enables responsive activation, tactical control and balanced handling. With 100 Lumen LED, it delivers more lumens than the previous model. The T3 runs on three 123A lithium batteries which provide up to 2.5 hours of burn time. It is crushproof up to 2000 lbs., and scratch and water resistant. Easy to store, carry and handle, it is an invaluable asset for those who must face threatening situations.